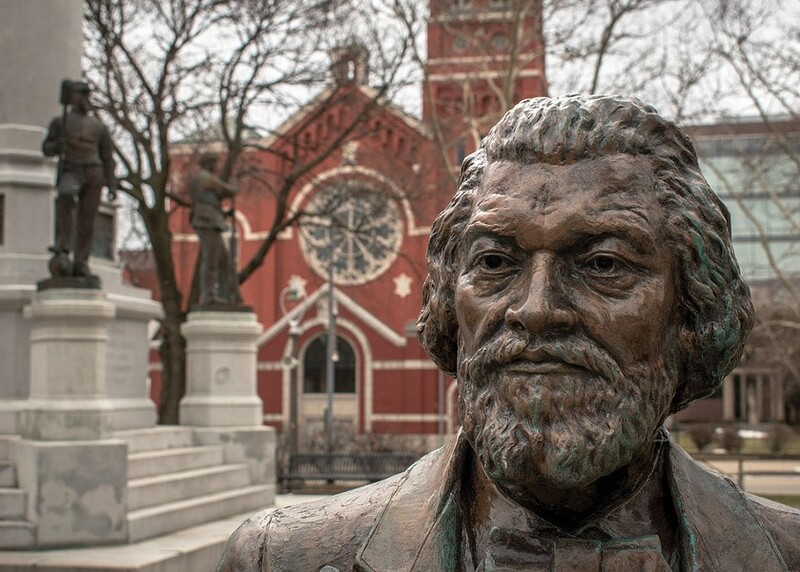 There's been a lot of buzz surrounding the legacy of Frederick Douglass in the past year, as 2018 was the bicentennial of his birth, and Rochester's cultural sector engaged in the Re-Energizing the Legacy of Frederick Douglass project. Part of that group's work included installing 13 Douglass statues, created by Olivia Kim, at different sites that held some connection to his life in Rochester. Last year one of the statues was vandalized by two young white men, sparking debates about enduring racism in this city. There's still a lot for us all to unpack, together. This week the Memorial Art Gallery will host a discussion about the history of Frederick Douglass, public art, and the legacy project. Panel participants include Carvin Eison, College at Brockport professor of Journalism, Broadcasting & Public Relations and Project Manager of Re-Energizing the Legacy of Frederick Douglass; Joan Saab, University of Rochester professor of Art History and Visual Culture Studies; and Carolyn Vacca, Monroe County Historian and St. John Fisher College professor and chair of History. The discussion will be moderated by Amanda Chestnut, artist and Arts Administrator at Flower City Arts Center. Wednesday, April 17, 7 p.m. at Memorial Art Gallery, 500 University Avenue. Included with museum admission: $6-$15. 276-8900; mag.rochester.edu.